When Jen Lee and I brainstormed the idea to offer The Gift of This Moment as a three-month subscription, I had this vision of making a video sharing my favorite pieces of this home retreat kit and explaining why working through it as a three-month journey would be such a powerful experience. But we are living in real time over here, and as Jen and I talk about in her podcast, things don't always unfold the way we think they will when we release an idea into the world. So today, I feel really moved to instead tell you a story about how I turned to these practices in the midst of a recent moment of overwhelm. One evening last week found me holding my daughter as she sat in my lap in the middle of the kitchen floor. She was sobbing about her sparkle shoes. I was at a total loss as to why she was suddenly sobbing about these used to be favorite shoes. Over the previous few days, she'd been getting angry at them and me whenever she tried to put them on, and I'd decided to handle it by giving her space as she wanted to "do it myself!" On this evening though, she's given up and come into the kitchen with one shoe off and one shoe in her hand and her face showing an honest despair. I got down at her level and she pointed for me to sit, then she turned around and backed up until she plopped into my lap. I held her as she cried and tried to make a few suggestions to help or even distract her, but nothing worked. After a few minutes, I started to cry myself because I didn't know how to fix it and I just felt so tired. The sparkle shoes began to represent a lot more than just shoes. I began to feel like I was gripping the piece of me that is "just Liz" by my fingernails before I slipped over the edge of a cliff of sorts. As Ellie kept crying, I started to breathe deeply, letting my breath really slow. Then, suddenly she took a deep breath and handed me her shoe and asked me to put it on and asked to eat some apple. And off we were back into the rhythm. When I needed to walk down the hall to get something while she was comfortably munching away, I paused in front of the hallway mirror and spent about 45 seconds looking at my exhausted face and whispered aloud, "You are not disappearing." Minutes later Jon came through the door and we were all in an uproar again in the way that happens sometimes when everyone's feelings are on the surface. We were basically circling around the beginnings of an argument as I was trying to make dinner while a dog, two year old, and husband circled around me in the kitchen. Eventually I got them settled in with more apple and a show and put dinner in the oven. 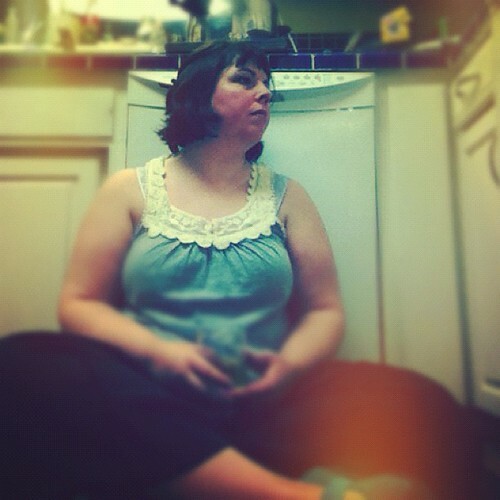 I poured myself a drink and blocked the dog out of the kitchen and sat on the kitchen floor, leaning against the dishwasher and took five deep breaths. Then I felt really moved to use my iphone camera to take a photo. This act of seeing myself reflected in the camera often feels like being in front of the mirror and is another way of saying to myself, "I'm not disappearing." Within about thirty seconds of taking this photo, a little girl was climbing into my lap and smiling and wanting to chat. And life kept going the way it always does. But I had my footing again because I had found myself in the momentary stillness. Start with the mirror meditation. Stand in front of yourself and let yourself gently fall into the truth of knowing you are right here. Begin to trust that you can breathe through this moment and the one after it. Do this everyday for a while. Then, begin to use your camera as a way to capture the beauty, the real, the truth of your everyday life. Keep looking in the mirror and use your lens to illustrate your story, your feelings, you real moments. And then, let poetry remind you that you are not alone as you let someone else's stories help to light your path. Try these practice because you want to be present for all of it...for the days that feel like trudging through the mud and the days full of more sunshine and love than you thought possible. Being present to this moment, right here, this is how you stay yourself in the midst of all the life hands you. I believe these practices will help you begin to feel deeply seen so that in those moments when you are making your way through the realness, the hard stuff, the confusion that sometimes punctuates this life, you will realize you are never alone. I believe this because I do it every day. The mirror saves me from myself sometimes as it literally gives me back to myself. My camera helps me to sift through all the stuff around and inside me so that I can find the stillness, the beauty, the raw truth that makes up each day. And the poetry of others lights the way and encourages me to put my stories onto the page. The Gift of This Moment invites you to create space for the stillness, the realness, and the wisdom that rests inside you as it guides you through these three practices. 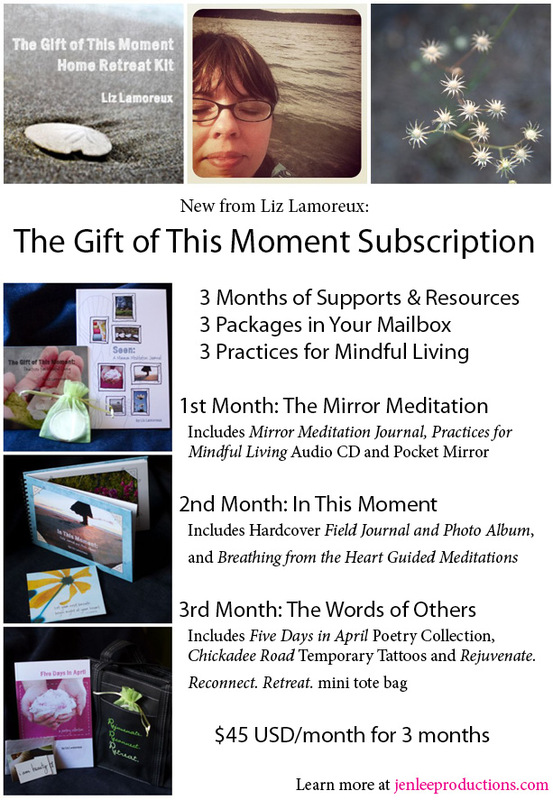 Working with these practices over three months, receiving a package of goodness each month, will provide you with even more space to lean into these practices that will help you stay rooted in this moment. Please just email me if you have any questions about The Gift of This Moment. Thank you for being here beside me on this journey.